Fangirls, I love Quirk Books. It’s a publishing company that seems like it can do no wrong, and I can’t get enough of it. I first heard of Quirk when I found out about The Fangirl’s Guide to the Galaxy, by Sam Maggs, that will be released early next month. Of course it peaked my interest, it’s about Fangirls. Then I realized that Miss Peregrine’s Home for Peculiar Children was also from Quirk. After that, I listened to Eric Smith’s The Geek’s Guide to Dating, and read the sequel to Miss Peregrine (Hollow City), and it has continued to escalate. Believe me when I say that the pure joy that comes with reading a Quirk book has continued through my reading of Nick and Tesla’s Special Effects Spectacular. Nick and Tesla are children whose parents have gone on an extended vacation, that seems a bit like a kidnapping. While they’re at their science uncle’s house, they’ve been getting into some very interesting adventures. The fifth of these adventures, the Special Effects Spectacular, is what I read this week. This is one of the coolest books I’ve ever read. It’s a young adult novel, so it isn’t really aimed at me, but this book is beyond amazing. It follows the inquisitive siblings Nick and Tesla (named after Nikola Tesla), and their discovery of some not so normal events at the set of a film being shot locally. They go to the set and realize that something’s up, so they use their incredible brains (and die-hard, movie fanatic friends) to figure out what the junk is going on. They use their own inventions to solve problems, their people skills to learn and distract, and their intensity to show that maybe kids can be right now and then. 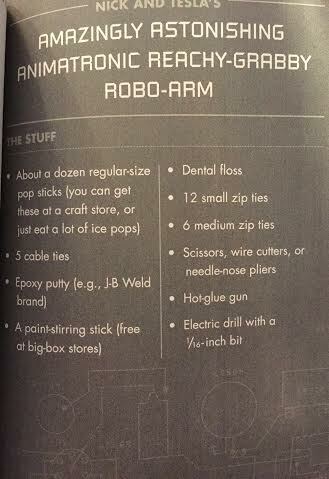 It has these rad little “how-to”s on the gadgets Nick and Tesla create, so you can make them too! I don’t want to delve too deeply into the plot, because the book comes out May 5th, and I really want you to read it. The story promotes children’s confidence in themselves, but it also has diagrams and instructions on how to make some of the fantastic inventions that Nick and Tesla create. And you know what, Fangirls? We need more books promoting science for both genders. Plus it has great illustrations. There’s nothing I love more than a good mystery, other than one that promotes gender equality. Tesla is amazing, and she really drives the book. Nothing against Nick, he’s dealing with the family’s extended “vacation” in his own way. But you’ll have to read to find out how. Altogether, the Special Effects Spectacular is about 230 pages, and I read it in a day. I haven’t read the prequels, so I’m going to have to find them. Since you’ve got until May 5th, I highly suggest you grab your favorite 10-12 year old, and do some inventing with Nick and Tesla. You won’t be disappointed. 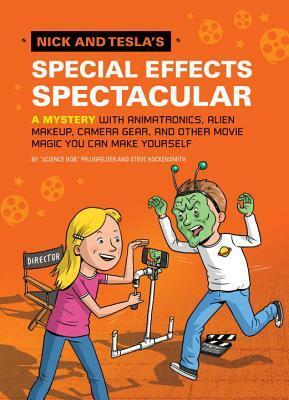 You can preorder Nick and Tesla’s Special Effects Spectacular on Amazon or Barnes and Noble and you definitely should.